Providing you the best range of centrifugal fan with effective & timely delivery. Blade Material Stainless Steel, M.S. 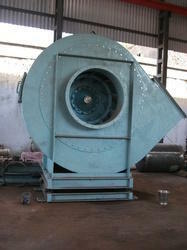 We are instrumental in offering optimum quality Centrifugal Fan to our valuable customers. Manufactured as per the set industry standards, these centrifugal fans are known for their high tensile strength, robust design and optimum durability. Being a quality conscious organization, the optimum quality of the offered fans is maintained at all times. Forward Blade type "SF". Theses Fans can deliver a large amount of Air volume at Low speed. Air Foil Blade type "SA" - This is the shrouded wheel with Hollow Blade for the highest efficiencies with non over Loading Power characteristics. Duties - wide Range of application for Ventilation, High Static Pressure and Large air Volume. Low Mechanical noise with single or double suction through various driving arrangements.